Receiving the award of the seal Wegbereiter ("Trailblazer") 2018 & 2019 on 21 November from the Verein Lernen fördern e.V. has confirmed EMPAC as a company that demonstrates social responsibility in everyday corporate life. For instance, EMPAC works with the association to support people with disabilities or refugees by offering them training and integrating them in the company. 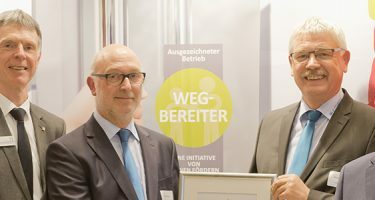 Dr. Klaus Effing, District Administrator (right in the picture), awarded the seal to 94 companies in the region who are committed to fostering long-term working and training relationships at the Hotel Leugermann in Ibbenbüren. During the presentation, the "Trailblazers" all received certificates and stickers for the doors of their business premises - including managing directors Michael Hans and Richard Sievers. Since 1984, the members of the association Lernen fördern e.V. 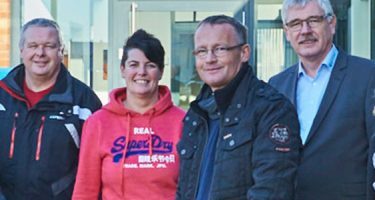 have been supporting disadvantaged people, and working with regional protagonists to help people with disabilities or disadvantages to integrate in working life.